The Near East or the Levant—what today are Turkey, Lebanon, Syria, Iraq, Israel, Palestine, Jordan and Egypt—has been a very important geostrategic zone of confrontations between the Europe of the forests, the snows, the rivers and the mists, and the deep East of the dry, jealous, sterile and inhospitable spirit of the desert. In this area there have been, from time immemorial, ebbs and flows from both Europe and Asia and Africa, and crystallized in the appearance of the Neolithic and the first civilizations of the world. Paraphrasing Nietzsche, we would say, ‘if you stare at the desert for a long time, the desert will also stare at you’. If there is a natural selection environment radically different from that of the glaciations, it is undoubtedly the desert: monotonous and infinite environment like the laments of the songs now preached from the minarets of the mosques. Immersed in this type of landscape for a long time, it is easy for a man to have visions and see illusions and distorted reflections; to listen voices that, according to oriental folklore, come from evil spirits and, finally, to lose one’s way and sink into despair and madness, and let your mind take a journey into darkness, from which it will never return. The deserts are the places where the total absence of the fecundating power of heaven—represented by rain and lightning, and by typically European gods such as Zeus or Jupiter—has propitiated the triumph of the Earth, and therefore the death of Nature and the levelling, the devastation, the equalization of the horizons and the lack of permanence of the same floor that is stepped on. It is totally imprudent to think that all these elements do not leave a deep mark on the idiosyncrasy and collective imagination of a people. The subject that we treat is revealed as a confrontation that, in last instance, is reduced to an evolutionary insurrection of the East not to disappear in an unequal competition with the European human varieties. In 56 BCE, in a speech entitled De Provinciis Consularibus given in the Senate of Rome, Cicero himself describes the Jews, along with the Syrians as a ‘race born to be a slave’. Syrians and Jews were ethnic communities in which the Armenid race was strongly represented, and which are encompassed as Semitic cultures. The Semitic waves constituted, for millennia, a source of pain, malaise, violence and tragedy for Europe, from the Carthaginians to the Ottomans. The present book will deal particularly with the Jews, without forgetting other groups that, like the Arabs, Persians and Syrians, made common cause with them on many occasions, including during the rise of Christianity. Although today they try to unload Europe with an unreal multiculturalism, the daily and historical reality is that the coexistence between different races has only two results: third-worldization and/or balkanization: ethnic conflicts and territorial ruptures. What we are going to see in this book, of course, has nothing of multi-cult and nothing of ‘peaceful coexistence’, since for centuries and centuries the coexistence between Greeks and Jews was marked by great waves of bloody violence. It did not work. Far, therefore, from the politically correct fantasy of the ‘coexistence of cultures’, we will investigate the beginning of a series of ethnic cleansings throughout the Eastern Mediterranean, which would culminate in the low Roman Empire with eradication, in North Africa and in the Near East, of the Greek and Roman communities and of most of the classical legacy at the hands of the East. Just ignore the PC title of this YouTube clip: ‘Mapping Indo-European language expansion’. For ‘language’ just replace ‘racial’ or ‘Aryan’ and you’ll get the picture (see Arthur Kemp’s history of the white race for a textual explanation of such expansion). The call of the South—Struggling through the mud. We know to-day why our ancestors were not attracted to the East, but rather to the South. Because all the regions lying east of the Elbe were like what Russia is for us to-day. The Romans detested crossing the Alps. The Germanic peoples, on the other hand, were very fond of crossing them—but in the opposite direction. One must bear in mind that at this period Greece was a marvellous garden, in which oak-forests alternated with orchards. It was only later that olive-growing was introduced into Greece. The reason why the climate has become temperate in Upper Bavaria is that Italy was deforested. The warm winds of the South, which are no longer held in check by the vegetation, pass over the Alps and make their way northwards. The Germanic needed a sunny climate to enable his qualities to develop. It was in Greece and Italy that the Germanic spirit found the first terrain favourable to its blossoming. It took several centuries to create, in the Nordic climate, the conditions of life necessary for civilised man. Science helped there. For any Roman, the fact of being sent to Germania was regarded as a punishment—rather like what it used to mean to us to be sent to Posen. You can imagine those rainy, grey regions, transformed into quagmires as far as eye could see. The megalithic monuments were certainly not places of worship, but rather places of refuge for people fleeing from the advance of the mud. The countryside was cold, damp, dreary. At a time when other people already had paved roads, we hadn’t the slightest evidence of civilisation to show. Only the Germanics on the shores of the rivers and the sea-coasts were, in a feeble way, an exception to this rule. Those who had remained in Holstein have not changed in two thousand years, whilst those who had emigrated to Greece raised themselves to the level of civilisation. The Greek profile, and that of the Caesars, is that of the men of this North of ours, and I’d wager that I could find amongst our peasants two thousand heads of that type. First and foremost, if the white race must be preserved, a scientific definition of “white race” must be provided. Editor’s Abstract: The European race is divided into three primordial races: the European Nordid White (“White Nordid” or WN), the Nordid Central Asian Redhead (“Red Nordid” or RN), and the Near Eastern Armenid. The white race is actually a mixture of two or more races. We cannot say, “This person is a pure white” but “This person has a mixture of A, B and C races in such proportions.” With terms like Aryan or White we designate a mixture between White Nordid and Red Nordid and its mild crossing with non-white “Armenids” or “Mongolids”—usually people of Germanic and Slavic origin. Therefore, while the ideal white is a White Nordid with a Red Nordid, we cannot say that those whites who have some Armenid or Mongolid genes are non-whites. However, we could say they are non-whites if they have substantial Armenid and/or Mongolid and especially Congid genes. In the new racial classification the phenotype is more important than genetic studies. The story of Roman expansion to the east is no less dramatic than that of its extension to the west—the major difference was that in racial terms, the effect of occupying areas to the east was far greater than the areas in the west. In fact, it was the extension of the Empire to the east which ultimately led to its downfall, for through the inclusion of eastern territories, vast numbers of people were drawn into Rome who shared a different genetic inheritance than the original founders—unlike the situation in the West. Once again, as had been the case with every great civilization before it, Rome fell because the original people who created the Empire disappeared: submerged into a mass of foreigners—replaced by immigrants and the descendants of slaves brought in from all over North Africa, the wider Mediterranean and the Middle and Near East. to the southern reaches of the Nile. this region were given access to Rome itself. 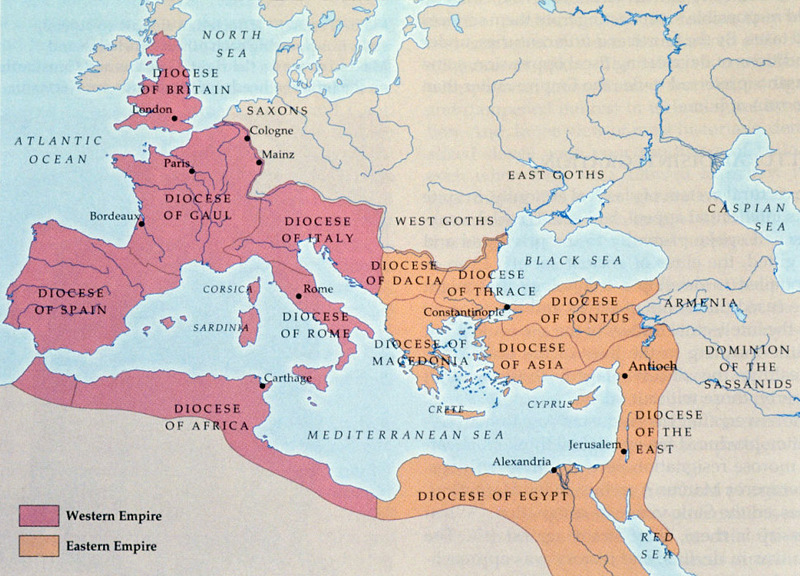 Prior to the Roman expansion into the Middle and Near East, the process of racial integration in that region had proceeded apace. Original Nordic Indo-European and Old European Mediterranean types had all but vanished by the year 100 BC. In the space of a few hundred years, large numbers of Indo-Europeans had been completely submerged into the far faster breeding Semitic, Arabic and Asian elements filling up the Middle and Near East. The infiltration of Roman society by individuals born in all corners of the world was exemplified by the emperor Philip (244-249 AD). Born in the Roman province of Arabia, in what today is the village of Shahba, roughly 55 miles south-southeast of Damascus, Philip’s father was a prominent local man, Julius Marinus, who had been awarded Roman citizenship and was thus not a native born Roman. Nothing is known of Philip’s mother. Known as “Philip the Arabian,” Philip was an emperor who was clearly not of pure European descent. The vast numbers of Arabic Semites and mixed races included in the new regions in the Middle East and North Africa were all put through the customary Romanizing process. Within the space of a few decades they were allowed to elect senators to the Roman senate in Rome—their sheer weight of numbers soon meant that true Romans quickly made up a minority of senators in the capital of the Empire. It takes no imagination to understand how the relatively small group of original Romans soon lost control of the racial make-up of Rome under these conditions. It was, simply put, demographically impossible for the Romans alone to supply the manpower to run such a vast area. They were forced to Romanize the local population and recruit soldiers and tradesmen from the local populations. Very often only the most senior civil servants in the Roman provinces were actually originally from Rome—and in a very many cases, even they too were supplanted in the course of time by locals. Eventually the logical step was taken by the Emperor Caracalla in 212 AD, when he gave all free men in the Empire Roman citizenship, the racial implications of which were huge and which have already been discussed. Caracalla was himself born of a Roman family in Africa and a Syrian mother—his own dubious citizenship status may have played a role in his decision to extend citizenship to all.